This phase is essential for many companies in the fashion sector, mainly for those that sell their products through multi-brand stores, as they need to be very efficient in collecting orders and coordinating their commercial campaigns. To be effective in sales while being efficient with time, commercial agents must have mobile applications to display collections and pick up orders, without having to travel with clothing samples. Similarly, it is important that stores have access to a B2B channel as complete and advanced as possible, which allows them to make their orders and replacements in a simple way and with as much information as possible easily available to them. In addition, it is essential to properly coordinate the work of the agents, with tools that allow the commercial director to control the execution of their strategies and ensure that the sales force has all the necessary information to properly monitor opportunities and to give personalized attention to each client. Electronic version of a clothing brand’s catalogue, which users can view everything the customer needs to make their purchases on devices such as tablets or smartphones, with the obvious benefits of not having to transport a physical sample of clothes. Includes: photos, videos, models, collections, looks, colour cards, sizes, prices, and more. Both commercial agents with their own application as well as stores through the B2B application can select the items they want and place their orders online. In this way the brand saves a lot of time in unnecessary trips and meetings, and customers get the immediacy they need when planning their orders. The fashion seller application includes an opportunity management module, which allows you to keep track of your current or potential customers and plan commercial actions, such as visits to stores or promotions to improve your sales. With this you can optimize your efforts and not waste time with opportunities that are not worth it. Analysing current commercial actions and their performance is fundamental to improve decision making and therefore the fashion sales. To make this possible, we offer sales managers the opportunity to generate multiple kinds of tables, graphs, and reports from existing data. Choose a solution that resolves the principle needs of the sales area of the fashion sector, which is already implemented in other companies similar to yours and that allows you to move forward without needing to innovate technologically. A solution designed for the long term that is highly configurable, that allows you to continually prioritize what is important, and that integrates easily with your other applications. 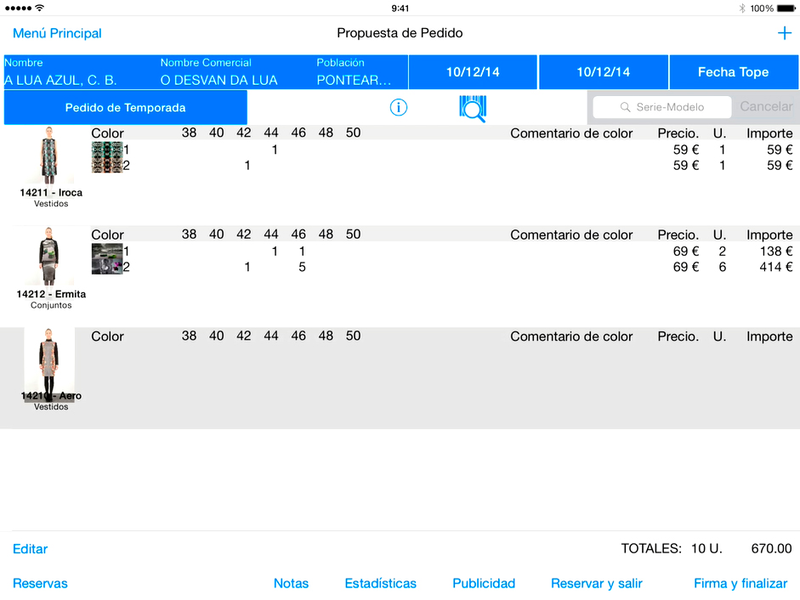 · ERP for companies in the fashion sector: commercial management, billing or reports, among others.